Right before the holidays last year we shared a DIY Peekaboo Toy Turtle tutorial from the book, Flip Dolls & Other Toys That Zip, Stack, Hide, Grab & Go by Laura Wilson. 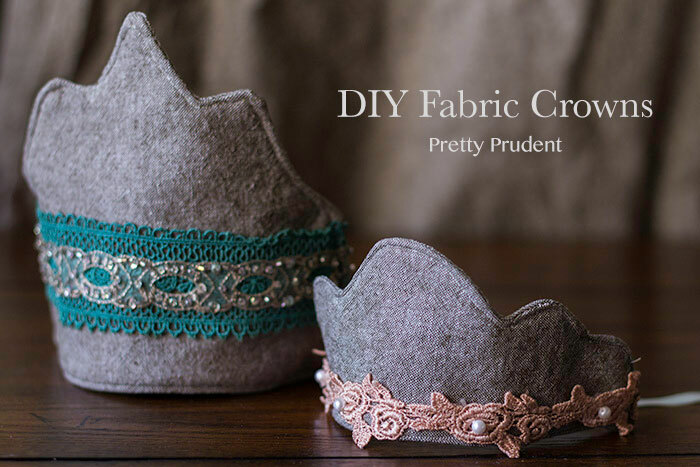 Today, Laura is back with another awesome project – DIY Fabric Crowns. 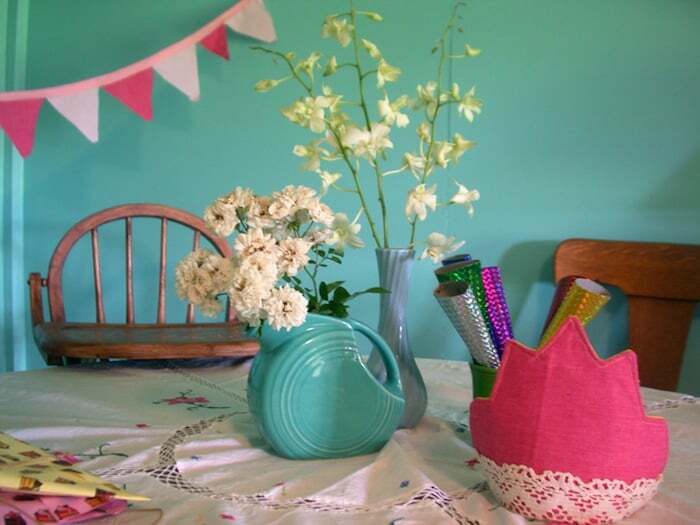 These adorable dress up crowns are super easy to make and come with six different templates. I tried my hand at making a few out of linen, as you can see here, but you could easily make these from cotton and felt too. 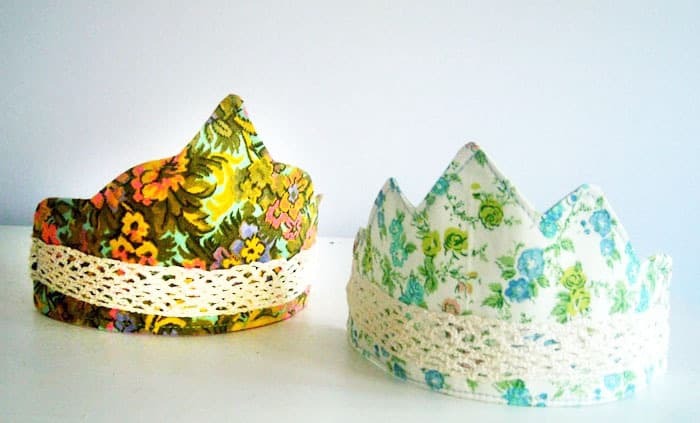 Below is one of Laura’s cute fabric crowns. Head on over to Laura’s blog and shop, We Wilsons and Wilsons on Etsy to see more of her creative projects. You can also pick up a copy of her book, Flip Dolls & Other Toys That Zip, Stack, Hide, Grab & Go. 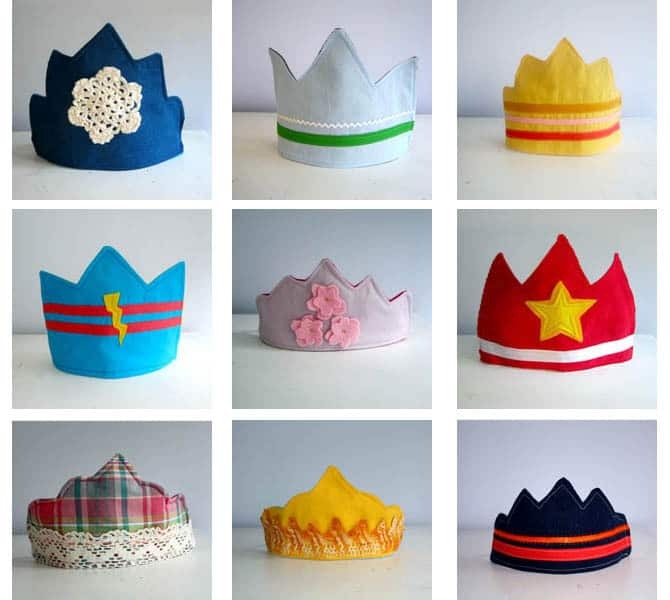 A few years ago, I made dress up crown for my daughters’ birthdays. I meant for the crowns to be an extra special birthday thing that we got out only once a year. But, as these things go, the girls loved them, and they found a permanent home in our dress up basket. Back then, I had no idea how much the kids would love dress up, which is a daily occurrence around here. Last year, my kids and I did a little project giving away crowns to anyone who wanted them, friends or strangers – anyone who needed to be reminded they are feel special. 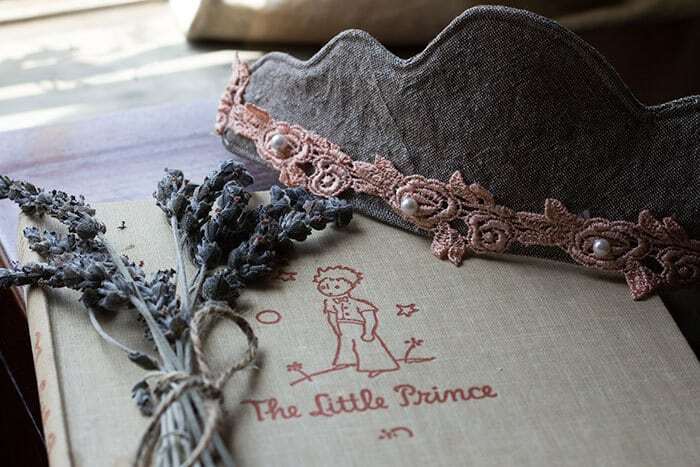 A silly, simple, dress-up crown, that they can put on and become a Princess or King, Victor or Olympiad, Superhero or Fairy, or whatever special person they imagine. We gave away over 130 unique crowns, and met a lot of interesting people with stories of struggle and grief and triumph. We learned that everyone is special, and reminding someone of that feels really awesome. So, what are you waiting for? I bet you know someone who needs to feel special, too, right? My tutorial is below. As usual, I tried to keep it simple. I’ve left the elastic exposed and used materials I keep on hand. 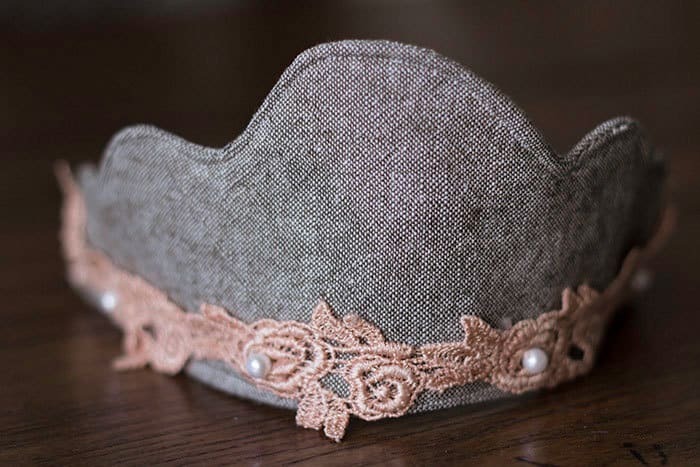 The crowns have about a 17″ circumference that will stretch quite a bit, so they’re one size fits most – just use a bit more elastic if you have a big head. The trimmings are the best part, of course. I love dumping out my fabric and ribbons and sifting through to find just the right match for that funky ribbon, or finding a surprisingly lovely combination of fabrics. 1. Draw or print templates from HERE. If you draw your own, the width should be about 9 inches. 3. Cut out interfacing and iron to the wrong side of your back fabric. Alternately, you can just cut a third layer of heavy weight fabric and put it in the middle of your sandwich – both work well. 4. Topstitch trimmings onto the front of the crown. I used ribbon, bias tape, buttons, lace, shapes cut from felt, and a handmade crocheted rose. The possibilities are endless. 5. Cut a 9″ piece of 1/4″-1/2″ elastic. 6. With right sides facing, sew around the edge of your crown. Leave openings on the bottom inch of both sides. You’ll turn right side out through one of these holes, and later insert the elastic in each side. 7. Clip slits in seam allowance, especially in the corners. Turn right side out, poking out all the little points and curves with a chopstick/pencil thing. Iron sound that all the points are neat, and the openings have their edges neatly tucked in. Don’t skip the ironing – it really helps. 8. Starting just after the opening on one side, top stitch around the crown. When you reach the opening on the opposite side, insert on end of the elastic (about 1/2″-1″ from the base of the crown) and back stitch over it a few times. Continue topstitching around the crown, and repeat the elastic insertion with the other end. Be sure not to twist the elastic. I love the fact that you made so many and handed them out to people that needed to reminded of how special they are. Such a cool idea! I will be pinning this to make some for the girls I help teach on Wednesday nights at church. It will be a great reminder that they are all special. Thanks for sharing the directions.